Burnice Tean (Arnold) Hill, age 87, died Monday, October 1, 2018. She was born December 25, 1930 in Big Sandy, TN to Pink and Flora Mae Arnold. In 1950, she married the love of her life, Perry Hill in South Haven, Michigan. They lived in Tennessee, Illinois, Georgia, and Texas before settling in the Oklahoma City area in 1973. 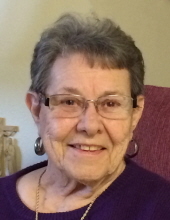 She was a member of the Holy Spirit Catholic Church in Mustang. Burnice worked as a police dispatcher for 12 years at Will Rogers World Airport. She was a wonderful artist, both with paint and pencil, she loved to crochet afghans and was renowned for her yeast rolls. She was preceded in death by her husband of 56 years, Perry, her parents, four brothers; A.L., Richard, James and Joe and son in law Richard Bettendorf. Burnice is survived by her three daughters; Cheryl Hill, Andrea Bettendorf and Tina Marshall, two grandsons; Adam Marshall and wife Lori and Daniel Marshall and girlfriend Falisha Shoun, great granddaughter Evelyn and a great grandson on the way. Also, by son in law Kevin Marshall, two sisters; Ernestine Arnold and Mary Ann Blankenship and sister in law Joyce Arnold, many nieces, nephews, grandnieces and grandnephews. Mass of Christian Burial will be 10:00am Thursday, October 4, 2018 at Holy Spirit Catholic Church, Mustang, OK with burial to follow at the Mustang Cemetery. To send flowers or a remembrance gift to the family of Burnice Tean Hill, please visit our Tribute Store. "Email Address" would like to share the life celebration of Burnice Tean Hill. Click on the "link" to go to share a favorite memory or leave a condolence message for the family.